This is my 1st SCN Blog dedicated to those who believe in Joy of Life Long Learning and my favorite ultimate MOOC platform openSAP !! It’s time to Share & Celebrate my Success Journey with openSAP. Recently I have achieved a personal Learning Milestone of completing 50+ Record Of Achievements(ROA) from openSAP MOOC itself. Though I’ve enrolled many more MOOCs like Coursera, EdX, Udemy, Udacity, etc and track these MOOCs using Class-central MOOC aggregator tool (https://www.class-central.com/), My Completion and Success Rate is relatively high in openSAP. 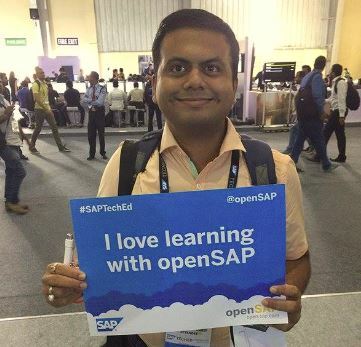 The journey started in 2013 when I got an email from my Competency Manager at PwC India regarding openSAP enrollment. Thanks to him for driving Social Learning !! Being a SAP Human Capital Management and SuccessFactor Consultant with ABAP, the courses offered by openSAP were not directly related to my Job profile. However, I enrolled for the 1st openSAP Course on “Introduction to Mobile Solution Development for the Enterprise” to add some extra skills . The course content was so engaging, you won’t believe I completed it successfully with 86% and below Record of Achievement. Even I laminated those Colorful Certificates and reviewed them periodically to boost my Confidence Level !!! After that no looking back, I even addicted to openSAP. 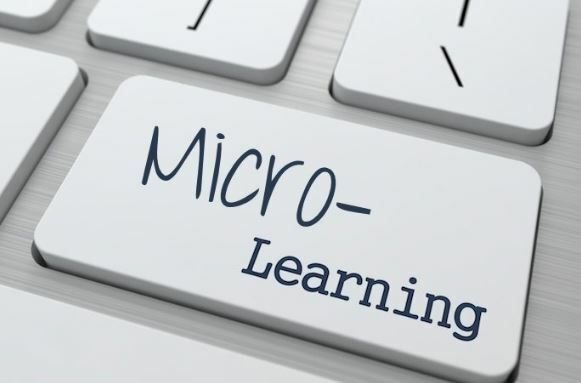 As a lifelong learner, I am constantly honing my SAP expertise by going through openSAP,SAP Learning Hub, attending webinars from ASUG, INDUS, SAUG, Tech events like SAP TechED, SAP Inside Tracker Program and participating in forum discussions in SCN. 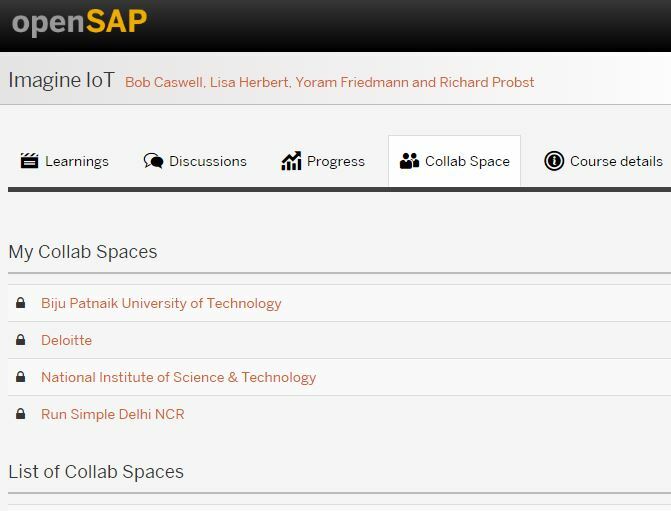 Anyway MOOC offered by openSAP is so engaging that I can’t miss any of these with more than 50+ Record of Achievements most of them floated in my LinkedIn Page at https://www.linkedin.com/in/nbnayak/ . It has added value to my Career Progression. In last TechEd Bangalore 2016, event I was recognized by the SAP Experts from SAP Education team for the same. 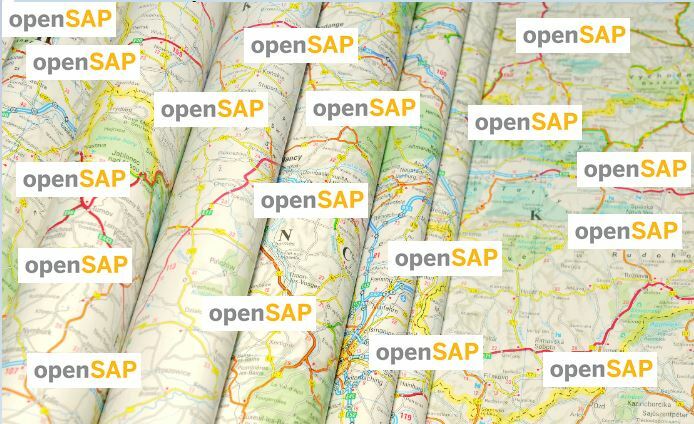 So, what’s unique about openSAP MOOC. Short, Clear, Concise updated Content. 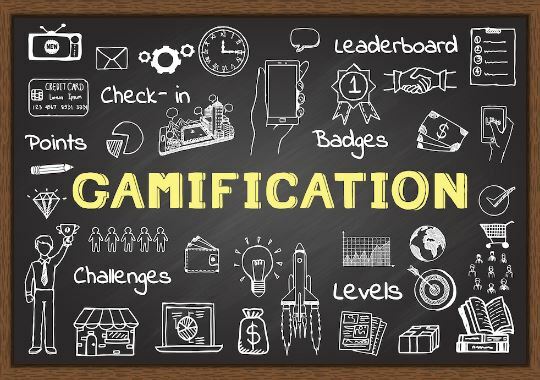 If the content is not engaging, I don’t want to continue like many other MOOCs available in the market. 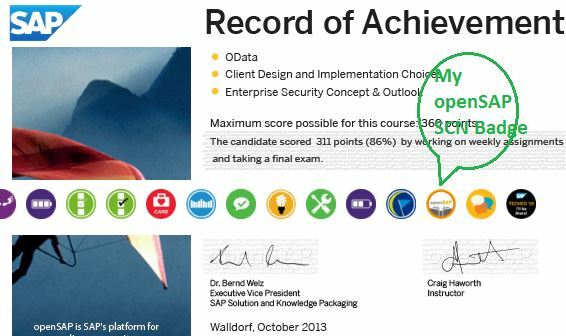 openSAP Badge in SCN, Earning Bonus points in peer review, Instant results of Quizzes and can be taken multiple time, real time and much more. openSAP MOOC courses are very much interactive. Prototype Challenges really give you feeling working in a Virtual Lab. Thanks to content strategy team. Everytime you get a notification/alert for your upcoming deadlines. 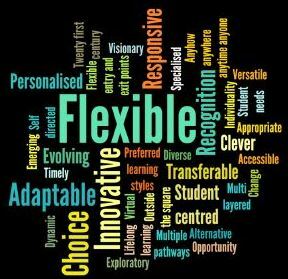 I valued the flexibility of my MOOC experience more than anything else. Busy professionals want on-demand learning experiences that can be accessed at their own convenience. I watched video lectures on my mobile while I travel in a metro , flight, or while cooking dinner. When I had a few minutes, I knew I could fit in a short video lecture downloaded earlier for offline view or read a bit of an online Collaboration Room discussion. I could do only a little at a time and still make progress, without disrupting my otherwise busy schedule. No matter what device I used Laptop/iPad or Smartphone, I could tell where I left off in the coursework. 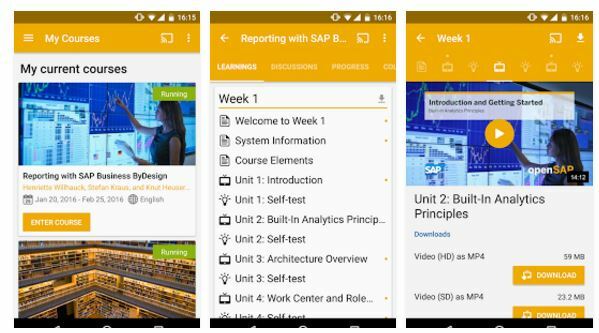 When traveling for work, I could squeeze in a few lectures or discussions using my smartphone while waiting to board a plane using openSAP Android App with 4.4 rating in Google Play store. openSAP MOOCs are free unless, like me, you missed any past course and want to activate the Certification at a nominal cost. openSAP MOOCs not only limited to SAP itself. We crossed mountains and rivers altogether in spreading our innovations in Learning. At openSAP Thought Leader Series, it has generalized courses for Digital Economy, Industry 4.0, etc. There are entrepreneurship journey discovery, Cybersecurity, Employee Volunteering courses too. My next Mission will be Creating an Impactful Learning Experience by driving openSAP and similar MOOC Courses across Universities !! Will you join me in this mission? Stay connected and keep watching this space !! All the BEST to openSAP Team for driving Innovative Immersive Interactive Digital Learning !! All views expressed are of my own. There’s no motive to promote /endorse any event, institution, platform, product or services. Thanks Clemens for your kind words !! Along with continuous learning with openSAP, My next mission is to drive openSAP exponentially across universities, communities especiallyTechnology Agnostic topics like Design Thinking, Digital Transformation – Thought Leader Series ,Entrepreneurship , Coding for kids, ..
People call me Sales guy for openSAP/SAP sometimes though I am a SAP HCM SuccessFactor Learning Consultant 🙂 I like that Tagline and happy to spread the word !! Wish me good luck in this venture !! !